You are the cocktailer. You have always been the cocktailer. Today on The Toast, my menu – complete with recipes! – for a terrifyingly easy The Shining viewing party. My injured finger is healing up just fine, but the odd position and length of the cut (and the swelling and pain from the tetanus shot) means my right (non-dominant) hand was useless for a full week, and not much better the second week. This long stretch of one-handedness fell inconveniently during a busy celebrating season, with two birthdays and several other parties to cook for. To my delight, I discovered that a little ingenuity and planning makes it easy to entertain one-handed; a trip to Trader Joe’s makes it even easier. These are recipes — heck, not even recipes, just templates and ideas and products — that I plan to use again and again when time is tight or inspiration is lacking. Here’s just a few of the festive dishes I whipped up with one hand tied behind my back. – goat cheese with store-bought tapenade, served with grape tomatoes, roasted red peppers from the grocery store’s olive bar, and crackers. – store-bought hummus topped with Trader Joe’s eggplant & garlic dip, served with pita bread, cucumbers, and olives. – brie topped with a palmful of brown sugar and a sliver of butter, then baked until bubbly and served with baguette, water crackers, and cold grapes. Also good with dried cranberries. – Trader Joe’s spanakopita triangles, spread out on a baking sheet, not crammed into their tiny tray, brushed with olive oil or melted butter, sprinkled with coarse salt, and baked much longer than instructed, until deep golden brown and crispy. They weren’t as delectable as homemade spanakopita, and no reasonable person would expect them to be — but they were pretty darned good. – pulled pork. The Fella diced up the fixings for a taco bar, and I contributed a big mess o’ pulled pork, which required me to open 1) a butcher’s packet; 2) a bottle of BBQ sauce; 3) a tetra pack of cheap red wine. It is fannnnnntastic. – ganache for frosting: just heavy cream brought to a boil and poured over good chocolate, then stirred until smooth. My professional-baker fancy-pants sister even gave me instructions for whipping it (much better instructions than Cooks Illustrated cookbook, by the way), but in the end I realized that dipping cupcake tops into the warm ganache would be faster and easier than any other method. – baked brie again, because WHY ON EARTH NOT? – more store-bought hummus spiked with lemon, topped with eggplant spread, and then sprinkled with the last of the tomatoes from the taco bar, seared with olive oil and chili powder, served with pita. – oven-baked frittata with frozen spinach and caramelized onions, using up the last of the onions from The Fella’s taco bar. – a perfectly simple salad: greens topped with cranberries and toasted almonds and tossed with good balsamic vingar, superb olive oil, cracked pepper, and Polish finishing salt. 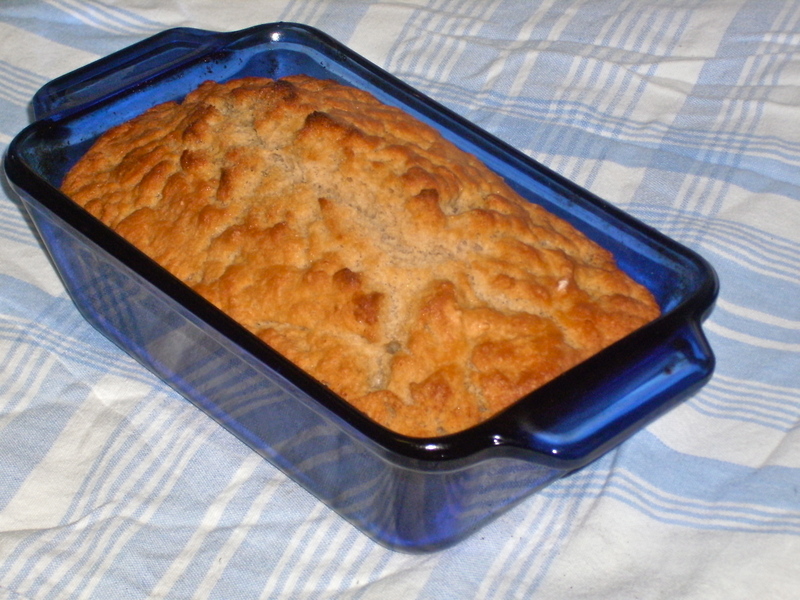 – a half-baked loaf of bread (from TJ’s again), finished in our oven. – buttery cake (on The Fella’s birthday, I baked the excess yellow-cake batter in tiny loaf pans and froze it), stabbed with a fork and soaked with orange syrup (simple syrup spiked with OJ and triple sec, reduced until thick), then glazed with the last of the ganache. I served three tiny slices on each plate, fanned out and drizzled with another spoonful of orange syrup… and I am converted: syrup-soaked cakes from now on! – a final dessert garnish: chocolate-covered orange jelly sticks. – goat cheese with good balsamic vinegar —the thick, expensive syrupy kind — and toasted slivered almonds, served with crackers or baguette. I made this twice, and not the same evening as I served the goat cheese with tapenade.. and by “made it,” I mean “tore open a packet of goat cheese, poured balsamic over it, and toasted some nuts.” It’s crazy-easy and crazy-good — so crazy-good that I made it twice in the last two weeks to take to some pretty ritzy doings. – various permutations of hummus-with something: hummus with lemon and roasted red peppers and olives, hummus with tapenade, hummus with eggplant spread and tapenade, and so on. – mushroom caps rolled in olive oil, filled with spoonfuls of frozen spinach souffle and baked. – Whole Foods dumplings or gyoza warmed in sesame oil and scattered with scallions. These last few ideas sounded so good it’s a shame we didn’t get to try ’em. Oh, well, maybe the next time I inflict a horrible injury upon myself, we’ll get around to these. Every year, our referral logs show that visitors arrive at macbebekin searching for vegetarian-friendly Thanksgiving dishes. (And sometimes not-so-vegetarian-friendly Thanksgiving searches end up here, too.) Last year, I jotted down some tips and suggestions for a vegetarian-friendly holiday table, and in the same entry I outlined our proposed Thanksgiving menu, which centered around The Fella’s gorgeous roasted butternut squash galettes. This year, I have one more vegetarian Thanksgiving entree to suggest, and boy howdy, it’s a doozy! Inspired by The Kitchn’s rendition of Dorie Greenspan’s stuffed squash, I whipped up a vegetarian version of my own. You’ll notice that the recipe at the link includes bacon, but don’t get hung up on that: the key here is the technique, not the ingredients. And then flip it upside-down to bake. It’s so simple and so obvious: get the stuffing in contact with the pan, let the oven’s heat and the roasting pan’s surface work their alchemy upon the ingredients. 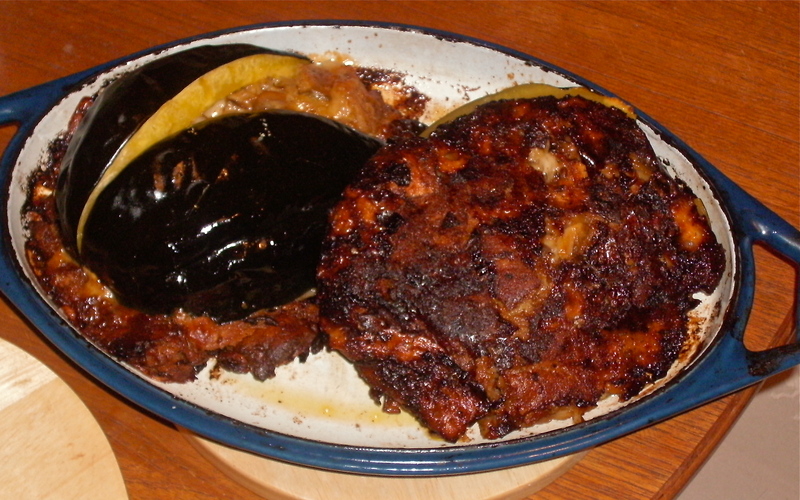 Here’s a photo of the squash halves, one still resting in the pan, the other flipped up to show off the crispy underside. As you can see, cooking them face-down results in tender roasted squash with a deeply browned, richly crisped crust over creamy soft stuffing. For me, a perfect dessert is a careful contradiction, a balance of textures and tastes, of sweet and salty and an undertone of something tart or bitter. And sometimes you can hit that balance by happy accident. That’s what happened here. 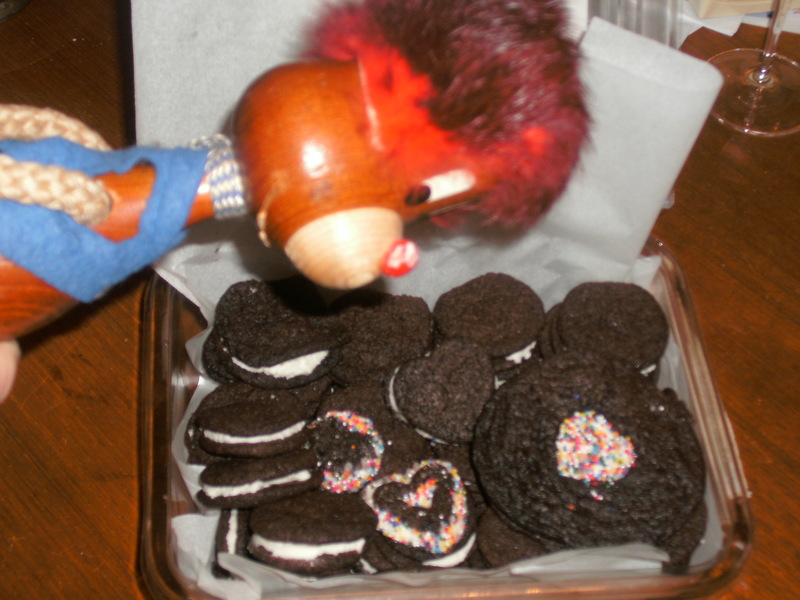 As a finishing touch for our recent Sandwich Party, I tried another blogger’s recipe for chocolate sandwich cookies. The flavors sounded promising, but something in it rang alarm bells for me. 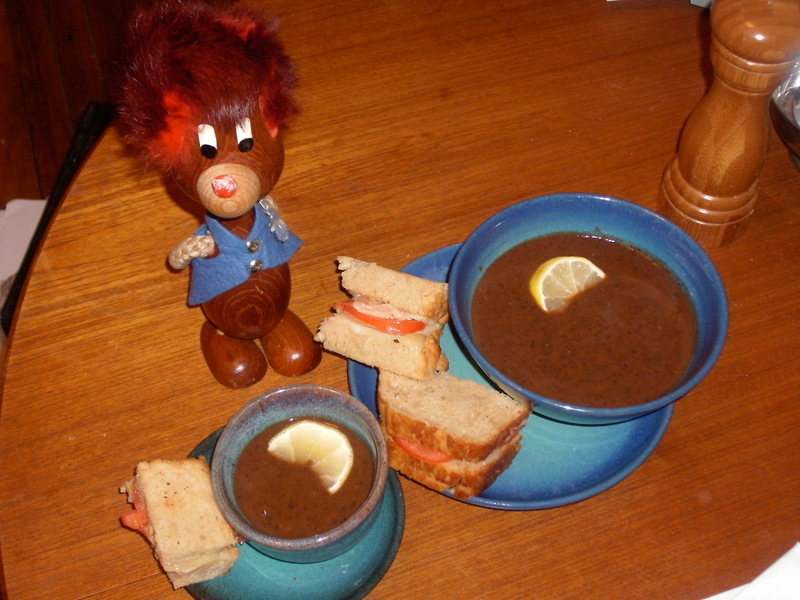 The Bitwrathploob has sampled sandwiches around the world, but that doesn’t mean he turns up his battered red replacement nose at humble homemade fare. Mmmm, beeeeeer bread. This savory quick bread goes together lickety-split. Just mix the dry ingredients, stir in the beer, plop it in the pan with some butter on top, and bake it until it’s crusty and fragrant. So good, so simple, so darned fast! With all these virtues to recommend it, beer bread shows up on our table often, cozying up to soup or salad or frittata, but this weekend you can expect to see it in a simple (and crumbly!) sandwich for the Sandwich Party. ginger beer: sweet and spicy! Following up on my summer goals, I recently made another batch of home-brewed ginger beer. Sweet, spicy, with a wicked kick, ginger beer makes a refreshing drink on its own or mixed half-and-half with lemonade. For an evening highball, try a Dark & Stormy: ginger beer with a splash of black rum and a squeeze of lime. Mmm, you can feel that summer breeze drifting your way, can’t you? This is an ersatz ginger beer; real ginger beer requires a ginger beer plant, a symbiotic colony of yeasts that carbonate the drink through fermentation. I decided not to buy or culture my own ginger beer plant. Instead, I followed Dr. Fankhauser’s instructions for fermented yeast carbonation, which gives a nice fizzy lift to a syrup-and-water base. For my long-ago first batch of homemade ginger ale, I followed Dr. Fankhauser’s directions carefully. The resulting drink was tasty and fizzy and exactly what he promised, but not spicy and dark as ginger beer should be. 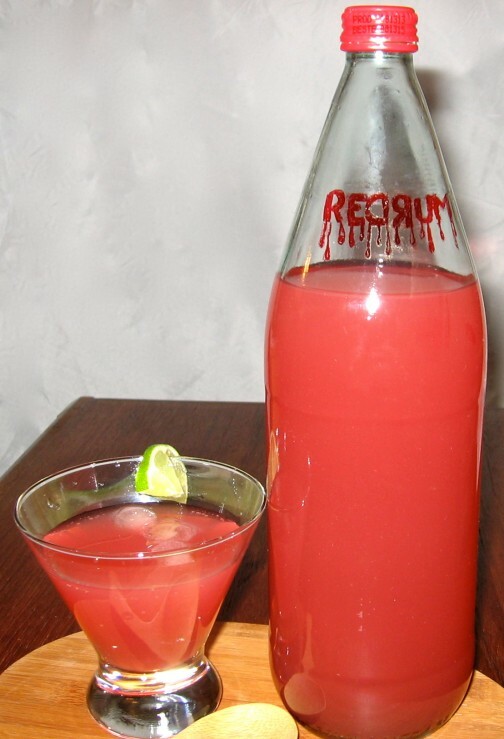 For my recent batch, I brazenly modified the ingredients and the prep technique to produce a richer spicier drink, but the brewing directions remain the same.